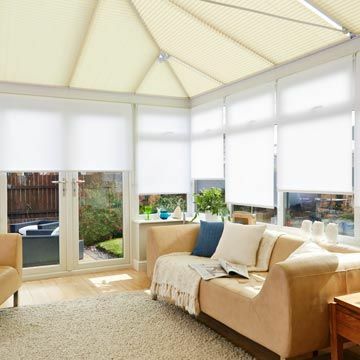 Keep your conservatory cool in the summer and cosy in the winter with our hardworking roof blinds. Choose from a range of colours and styles. Temperature control is one of the key reasons our customers choose conservatory roof blinds. In summer, sunshine blazes through the conservatory roof, while in winter, essential heat escapes through the same route. The good news is that our specialist fabrics can moderate these extremes, so you can enjoy your conservatory in all conditions. Ask your in-home advisor about our SolarPleat™ fabrics. These have a performance coating that reflects the sun, actively preventing light from being absorbed in summer while offering an insulating layer in winter. Our Conservatory blinds are extremely versatile. You can combine different styles or colours for the roof and the window, or mix and match performance fabrics to tackle specific problem areas. And to make sure your roof blinds always look their best, our TruePleat™ and MasterPleat™ technology ensure the pleats remain neat, smart and uniform for years to come. For the perfect finishing touch, our conservatory roof blinds are available with a variety of operating systems, including motorised options, giving you easy fingertip control over your environment.